Trait #2 – Rock Star Hygienist are always prepared before they seat their patients. If you’re a Rock Star Hygienist, this means you have learned everything possible about the patient before they enter your operatory so you have a very clear plan of action for each patient. Sometimes things change. If you have planned to re-present treatment in the upper right but the patient shows up with a broken #30, we obviously need to address the problem immediately. Having a clear system or checklist you use to review charts and prepare for patients is a key component to time management, patient confidence, self-confidence, enrollment success and ideal patient care. In fact, the shift to paperless charts makes this even more important. When information isn’t literally in your hands, it can easily be overlooked. Here’s a quick checklist for reviewing charts and preparing for your patients each and every day. Ideally, any needed x-rays would be in the appointment view but if not, you now know if they need x-rays before you seat the patient and you can have the sensor and holder set up and ready to go. You can also have the greeter give the patient a new health history if it’s time for an update. You can have the Prophy Jet full of powder and have a tip handy. If they have incomplete treatment, you know you’ll need to take a new photo so you can have the camera close by and plugged in. All these steps save you valuable time and energy and make you look good in front of your patient. But if you’re a Rock Star Hygienist…you already knew that. Trait #1- They love setting and achieving goals! Rock star hygienists are committed to achieving and even EXCEEDING goals. The rock star hygienist thrives on a sense of accomplishment. This type of team member responds well to the idea of being rewarded with team bonus based on goal achievement. Here’s a detailed breakdown of SMART goal setting. Specific: A specific goal has a much greater chance of being accomplished than a general goal. You want to take fluoride from 3% to 25%. Measurable: Establish measurable criteria for tracking progress toward the attainment of each goal you set. When you measure your progress, you stay on track. Incremental goals are a great way to keep your team moving forward. So if you started at 3% of adults receiving fluoride, your goal at the end of the first month might be 10%, then 20%, then 25%. Attainable: Attainable goals should be set so that you have to “stretch” a little bit in order to achieve it. “Stretching” doesn’t mean setting unrealistic goals. Increasing fluoride to 25% is realistic. It’s a lot higher than 3% but you’re not saying, I expect us to do fluoride on 100% of our adult patients. Relevant: To be relevant, a goal must represent an objective that you are emotionally committed to. Your hygiene team is more likely to be on board and move forward if they have a strong ‘why’. So for fluoride, what is the compelling reason for recommending it to patients with mod-high cavity risk? Less decay and fewer restorations? Current restorations lasting longer? Timely: Without a timeline keeping you committed, a goal easily falls off your radar. You’re goal is to increase fluoride to 25% within 3 months. The rock star hygienist also thrives on earning a reward once he/she achieves the goal. Remember, we all like to have a sense of accomplishment in our professional lives – make the reward something meaningful! Maybe it’s a ½ day of paid vacation per quarter or a cash team bonus or a fun team lunch at a special restaurant. Next week, I’ll reveal Trait #2. See you then! Over Christmas I watched the 80’s cult classic, “Sixteen Candles.” I’ve seen it dozens of times, as I’m sure many of you reading this e-zine have! I love the scene where the entire family is rushing out the door trying to pile into the family sedan en route to Jenny’s wedding. I get sweaty palms every time I watch that scene. The chaos and disorganization stresses me out but I can’t help but laugh at the craziness. I don’t do well with clutter, both personally and professionally. How about you? 2012’s e-zine theme is all about getting your house in order. It’s difficult to move patients forward in their treatment in an organized, seamless fashion if your practice “house” is in disarray. It’s a challenge to keep your team accountable and on task if you, as the doctor-leader, are scrambling to keep your head above water. Each week, we will be detailing some of the best-kept secrets of the most successful dental professionals in the business. Here’s to your house being in order in 2012! Scroll down to watch this week’s video to get you pumped up about a year of getting your house in order…. By the way, this is a picture of my all time FAVORITE scene in the movie. Have you spent your entire career trying to fix things? Of course! As dentists you spend 4 years of dental school learning to fix faulty restorations or fix broken partials. Then, in your career, you continue to perfect the fixing. As an office manager, you spend your days sweating over fixing holes in the schedule or fixing the collections problem, right? As hygienists, you spend hours trying to fix patients’ home care behaviors. But what about YOU? Have you ever taken a step back to look at getting YOUR house in order? The video talks about getting your internal house in order as priority #1. Then, once your house is in order, you can only then work on “fixing” everything else! I hope you’re enjoying a wonderful holiday season. Here at our house, we celebrate Christmas and this year was so much fun. Andrew is just big enough that he really enjoyed the celebration. 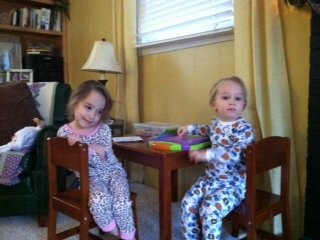 He and Anna love to color together so they are really enjoying their new pint-size table and chairs. Now if I can just figure out how to keep him coloring on the PAPER! As Stacy and I have been preparing and planning for next year, two themes have been showing up in our professional lives and client work. I’ve done a short video below to share those with you and give you a few things to think about as we move into 2012.